As soon as I left the DMV, the notion that we were in a place where we needed this placard crashed over me. Tears followed and sadness found its way back into my soul. Last week as I sat on the porch of my hotel room in Miami, the hot air filled my lungs. As I stared at the sky, I watched the planes as they almost rhythmically crossed my line of sight. I saw the stars as they twinkled brightly high above. I considered how amazing it was that these machines could fly through the air. And how the stars, while so far away and we could never touch them, that we could see them and marvel at them each night. I considered that progress, ever so slowly was creeping over E and our family. 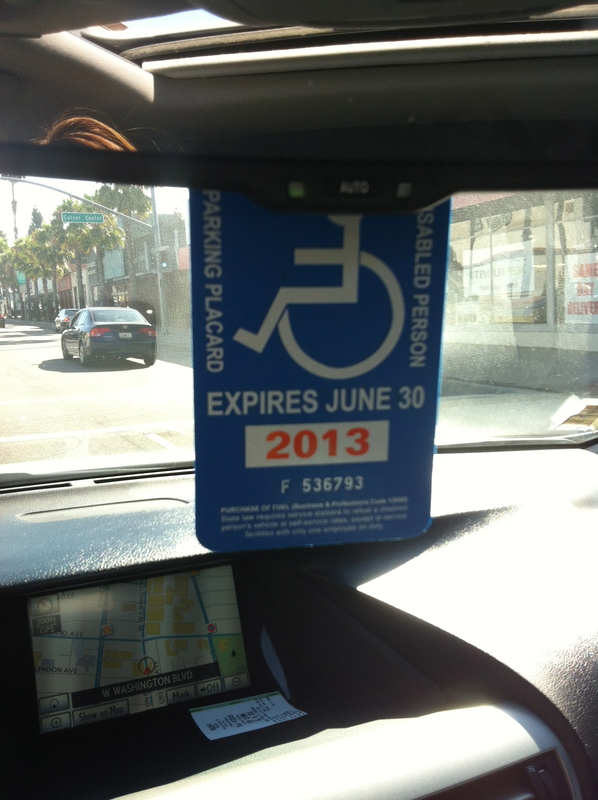 With this consideration, the image of the handicap pass flashed through my mind. I had never considered this as a possibility in our lives. That our precious daughter would ever require one so that our lives might become just a touch easier. And then, I realized it’s so much larger than this pass, or acceptance of this stage, it’s about what might be, and what we may know in just 2 short months. As I struggle with the possibility that a diagnosis for E may be just around the corner, I struggle with the idea that a diagnosis and subsequent prognosis, might chip away at her possibility. That somehow, any of the words from the doctor will make their way into the corners of my brain. When we see a geneticist on September 14, we will test for a syndrome called Angelman’s Syndrome. One of the symptoms is that the children are VERY happy. E is VERY happy. I am often told, she is one of the happiest babies people have ever seen. The possibility that this notion of her pure happiness could be stripped away, breaks my heart. Her happiness is an anchor for me. It keeps me going. Keeps me motivated. Keeps me feeling less guilty, less fearful, less bad that her life is so hard. The possibility that her happiness might be seeded in a diagnosis fills me with fear and sadness. And yet, in the answer to what must have been my silent prayer of possibility, the next day, I received this email. It was unprompted and unsolicited. It came from E’s Physical Therapist at her UCLA Early Intervention Program. It was titled “Great Day,” and it was filled with possibility. hope this email finds you better than the last one. just wanted to let you know that Emma had a great day – stood in the gait trainer for over 15 minutes while playing with 2 hands on instruments and going after koosh balls. We also had music playing, and she was so happy, laughing, making eye contact and seeming to really be having fun. She is trying to initiate steps in the gait trainer and has clear intent of wanting to move. She will take reciprocal steps when we push her in it. She is also holding onto the trampoline and riding toys with both hands much more consistently and for longer durations. i want to go over her program plan with you briefly when you get back – so we are all on the same page with goals and areas of emphasis as she really is making great improvements with repeated practice. Today she also took out 3 pegs from the pegboard – and fast vs. 3 weeks ago when i tested her and she did not pay attention to the same activity visually for even a moment. She is also mouthing much less also. keep doing whatever you doing – it is working! And in that moment, I remembered that we are still in charge of our possibilities. To continue to push, to try everything and anything that may give her a better shot at her best possible future. We cannot control what we are presented with, but we can control what our possibilities might be and how we can help to shape them. To not allow the reminder of what was possible be outweighed by what is still possible, this is the air of possibility. So today, remember that what is possible is what we can all focus on and with this in mind, we can find some part of today to make today ‘anewfavoriteday.’ And to quote dear C so gave me back some perspective, happy travels today my friends. Oh, Shannon, if only I could reach through this computer and squeeze you in the biggest hug ever! You are absolutely, wonderfully inspiring! E ins so blessed to have a mama who not only loves her with all her heart, but refuses to limit the possibility of who she will become, in her own time and her own way. I am overwhelmed by love and admiration for you. Shannon Pruitt SMPI Marketing Group, LLC strategy. media. packaging. insights. I can feel your anticipation radiating from the screen and my heart sends hugs to you and your daughter. Someone once told me that faith is the opposite of fear, so when I find myself fearful, I draw upon my faith and hit that fear with doubt, until it feels like whatever I’m fearing feels or looks more like an impossibility and that creates a will in me that makes me feel like superman! A quick anecdotal story about will…I work as a massage therapist for chronic pain and rehabilitative conditions and I had a patient about ten years ago, her name was Marilyn, she was in her late 60’s and had suffered a massive stroke 18 years ealier leaving her partially paralyzed. Immediatley after her stroke, her family was told she wouldn’t survive; once she survived she was told she would never get out of bed; once she got out of bed she was told she would never walk: once she walked with a walker, she was told she would never be able to walk with a cane: once she walked with a cane, she was told she would never regain feeling or additional mobility. This was true for 18 years until, in a moment of desperation and in need of some pain relief from all the atrophy,she decided to try massage therapy. We worked together once a week for 3 months and as her pain and atrophy improved, she was eager to progress more, so she did as much exercise that she could and we tried different modalities to create more improvement. By six months she had improved so much that she qualified again for PT. After a year she could bend her knee when walking and her atrophy in her hand and arm had improved. After two years she started having what she called tingling in the affected side of her body. She surprised all of the medical professionals who thought because of her diagnosis and the stats that go with the diagnosis, all that she was able to accomplish was impossible.She was an amazing woman and I’m so glad I got to witness her strength and drive. You have created a great support system for your daughter. I thnk that whatever her diagnosis, her possibilites are endless; especially with you cheering her on! Julianne! I love love love this story. Thanks so much for sharing…and it’s truly remarkable. I know my little E is just like her…she will take whatever awaits and surprise us all….except for us for we know she has it in her…it’s only a matter of time and we will do whatever it takes. Thank you for taking the time to write this all out, it means a tremendous amount to me. Love to you and your wonderful heart! Shannon! I had no idea you were going through this. That pass is a scary pass, indeed. We are still in charge of our possibilities. And, as Kasey knows miracles do happen. So just keep doing what you are doing. Because E was blessed to land in your family. She has a soft place to put her head each night. Keep holding hands and know that we are here for you. To support you, just as you are supporting your daughter! Sweetie! You are dealing with big stuff right now. Don’t worry about me. I’m here. Reading along. I hope you are okay. Thank heaven for little girls! ALL little girls, and BIG girls like Moms! Awww thanks Ardelle…indeed…thanks heaven for all us ladies who provide such wonderful friendship and kindness! Just found your blog on Twitter and this post spoke so well to me. We’ve been through the storage disease testing – which for us did not come to be – and expect we will have a CP discussion at some point for our 15 month old ex 24 weeker. Just want you to know that your blog is great and I wish all the best. You have a great perspective and I look forward to following you on your journey. Thanks so much for stopping by and saying hello. While our experiences are different, so many of our emotions have been the same and you clearly have been through a great great deal already. I wish you much luck, strength and perspective as your journey continues. No matter how sound of mind we are, having those conversations are so heart wrenching and difficult. Best wishes on your own journey and thank you for being part of ours. Thanks:) Hope you are well!